Luke Bryan is set to open Nashville’s only six-floor entertainment facility in the heart of Music City, LUKE'S 32 BRIDGE FOOD + DRINK. The must-see hot spot is located in Nashville's most sought after zip code with a prime location in the downtown district on the corner of 301 Broadway at 3rd Avenue. The 30,000 square foot building features six levels of entertainment space with eight bars, including Broadway’s only multi-level rooftop bars with sushi menu, four stages of live music and two restaurants. 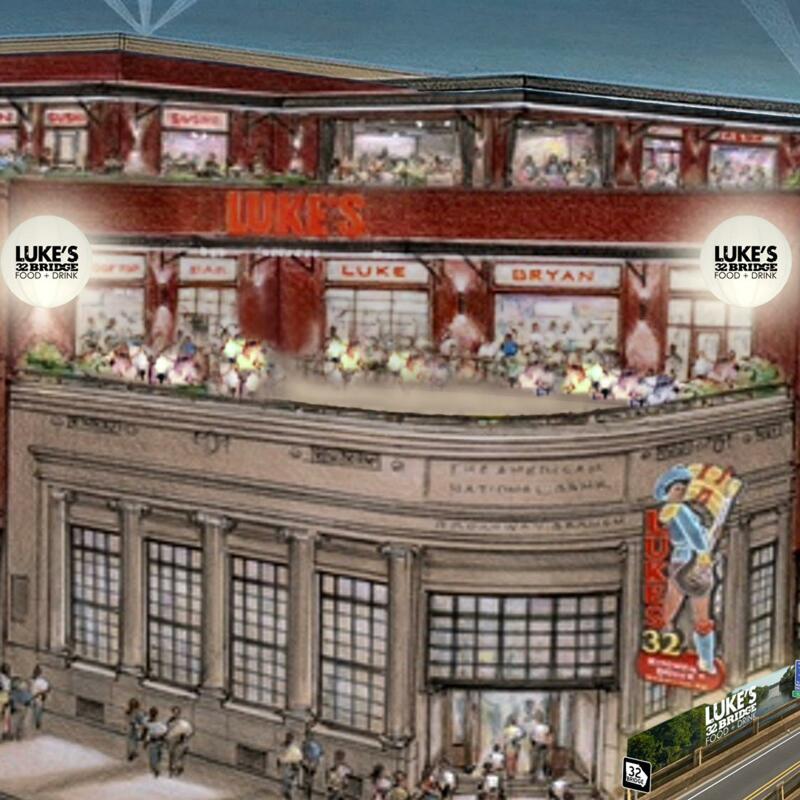 The name, LUKE'S 32 BRIDGE FOOD + DRINK, was inspired by Luke’s childhood home near Route 32 Bridge in Lee County, Georgia and is housed in Nashville’s iconic American National Bank Building. The facility, in partnership with TC Restaurant Group, is scheduled to open this month. "When I first moved to Nashville I played several of the bars on the ionic Broadway Street," shared Luke. "I never would have dreamt that I would one day be a part of a place that could offer the same dream to others. Because of Music City and the fans all across the country, the reality of this amazing venue has become possible." Visitors to LUKE'S 32 BRIDGE FOOD + DRINK will enjoy an aw-inspiring view from the multi-level rooftop that features Nashville’s only rooftop Sushi Bar with Chef Nick Phrommala. Chef Tomasz Wosiak helms the LUKE'S 32 BRIDGE FOOD + DRINK signature restaurant where he has created a menu inspired by some of Luke's favorites with special twists on Southern and American cuisine. Take your pick from hearty favorites Hometown Pulled Pork with Kettle BBQ chips, Black & Blue Salmon Salad, Nashville Hot Chicken to Luke's Elk Burger with Red Dragon Cheese. Burger fans are set-to-go with the Farmers Burger, featuring locally-sourced, all natural beef with over easy egg, maple bacon, cheddar cheese, lettuce, tomato, onion and signature sauce. Other go-to dishes are Beet Mixed Green Salad with Citrus Vinaigrette & hand-tossed oven-baked margarita and pepperoni pizza work to fill out a world-class menu. LUKE'S 32 BRIDGE FOOD + DRINK will offer one-of-a-kind drinks including some of Luke's personal choices like "Backstage"- vodka, grapefruit, with or without salt; "Play It Again"- cherries, vanilla bourbon, lemon juice, sugar and "Luke's Old Fashioned"- muddled cherries & oranges, cubed sugar & bitters, ice, whiskey & water- plus more. Go to www.lukes32bridge.com to learn more about LUKE'S 32 BRIDGE FOOD + DRINK.